USDA "Cattle on Feed" report shows slightly lower number of cattle and calves on feed and placements for January. The U.S. Department of Agriculture’s National Agricultural Statistics Service released the “Cattle on Feed” report Friday, revealing numbers that came in close to analysts’ expectations. Cattle and calves on feed for the slaughter market in U.S. feedlots with a capacity of 1,000 head or more totaled 10.7 million head on Feb. 1, slightly below last year. 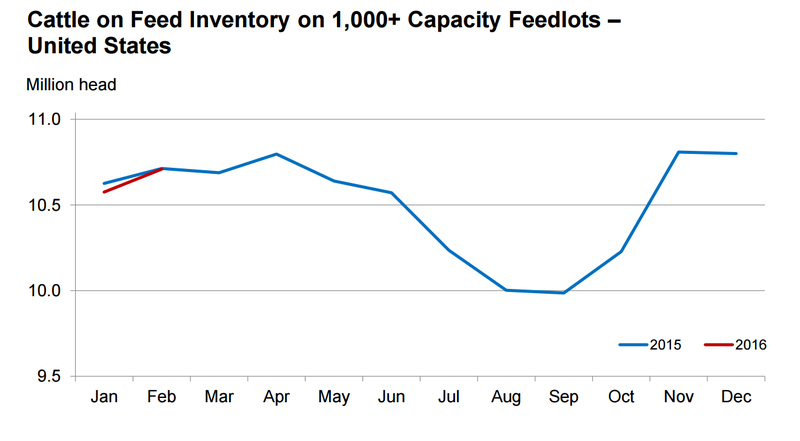 Placements in feedlots during January totaled 1.78 million head, 1% below 2015. Net placements were 1.72 million head. January placements of cattle and calves weighing less than 600 lb. were 340,000 head, those weighing 600-699 lb. were 365,000 head, those weighing 700-799 lb. were 494,000 head and those weighing 800 lb.-plus were 580,000 head. The only category that decreased year over year was the group under 600 lb. Analysts Len Steiner and Steve Meyer, in the “Daily Livestock Report,” said these numbers are a definite shift in the placement trend seen over the past several months, which focused largely on placing heavyweight cattle. “We expect to see relatively more placements in the lighter-weight categories in the coming months due to the larger year-over-year supply of feeder cattle outside of feedlots, along with improving profits of cattle feeders. However, heavyweight placements continue to be the largest group by far, and we believe that is a trend that will continue,” they said. Steiner and Meyer also noted that the latest USDA numbers show that the U.S. cattle industry is in a transition phase as placements have gone from below year-ago levels to above year-ago levels. “Of course, if there is a large shift in market fundamentals such as a short corn crop, these expected dynamics will change,” they added. Marketings of fed cattle during January — at 1.59 million head — were 2% lower than 2015 and were the lowest for January since the series began in 1996, USDA reported. Other disappearance totaled 56,000 head during January, 27% below 2015 and the lowest for January since the series began in 1996. The report also showed that cattle and calves on feed for the slaughter market in feedlots with a capacity of 1,000 head or more represented 80.3% of all cattle and calves on feed in the U.S. on Jan. 1, down 1% from last year's 81.6%. Marketings of fed cattle for feedlots with a capacity of 1,000 head or more during 2015 represented 87.2% of total cattle marketed from all feedlots in the U.S., down slightly from 2014.